So the festive season is almost upon us and while the sensation that is the Coca Cola Santa is evident nightly on our big screen, #MontyThePenguin is playing a blinder in dividing the masses on our small screens. It is the season for brands to be jolly and is also the one time of year where we seek out and want to engage with things that get us into the festive mood. So whilst some great and some questionable Christmas packaging floods our supermarket shelves, we thought we’d shine a spotlight on one of our favourite Limited Edition packs, which we had a wonderful time creating back in August. 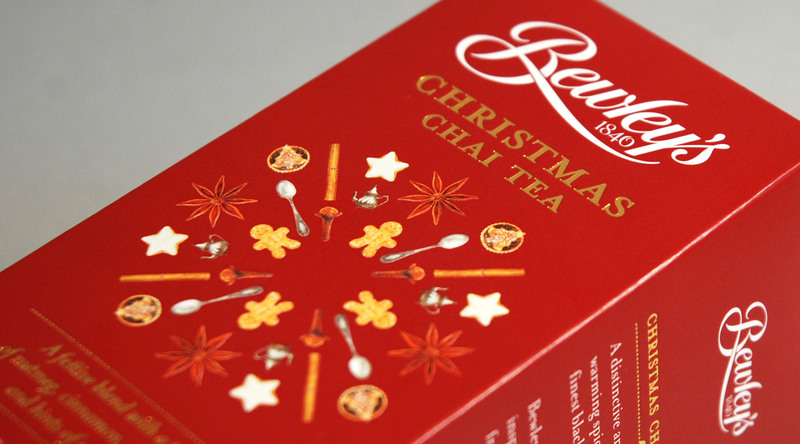 The old adage goes ‘Seeing Is Believing’ however with Bewley’s Christmas Chai Tea, the proof is most definitely in the taste. The unique festive blend of Chai encompasses cinnamon, nutmeg, rich vanilla and hints of sweet fruit…..It is a must for the basket this season. We used a number of festive treats as the basis for our illustration which we then fused with colour, typography, gold foils, beautiful descriptors and ended up with a Limited Edition pack that is destined to get you in the festive mood.